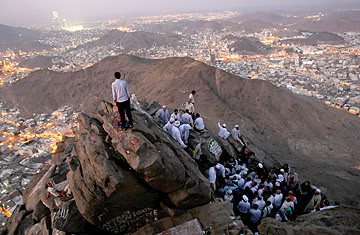 Muslim pilgrims pray on their way up Noor Mountain in the holy city of Mecca before the start of the annual hajj pilgrimage, on November 23, 2009. The city of Mecca in Saudi Arabia has always been the spiritual center of the Islamic faith: the world's 1.3 billion Muslims genuflect in its direction during prayers. But in the final months of the year, Islam's holiest city becomes even more vital, as an estimated 2.5 million pilgrims make their once-in-a-lifetime journey to the site. The Hajj consists of a five-day excursion, required by all physically and financially able Muslims, to Mecca and the nearby holy sites of Arafat, Mina, and Muzdalifah. Once there, pilgrims perform a series of rituals to unify themselves with other believers, absolve themselves of their sins and pay tribute to God. While the Hajj normally attracts pilgrims from all sects of Islam and all walks of life, concerns over swine flu have cast a shadow over this year's event; the prospect of millions of potential flu carriers mingling in Mecca has given health experts fits. Four early pilgrims have already died from the virus and Saudi officials have enacted a number of measures to combat the spread of the disease. Along with screening for flu-like symptoms at the Jeddah airport and distributing hygiene kits, health ministers have recommended that pregnant women, children and elderly worshipers stay home. The origins of the Hajj date back to 2,000 B.C. when Ishmael, the infant son of the prophet Ibrahim (Or Abraham, as he is called in the Old Testament) and Ibrahim's wife Hager were stranded in the desert. With Ishmael close to death from thirst, Hager ran back and forth between the hills of Safa and Marwa looking for water until the angel Jibril (Gabriel) touched down to earth and created a spring of fresh water for the baby, known as the Well of Zemzem. Following the orders of God, Ibrahim is said to have built a monument at the site of the spring known as the Kaaba. Worshipers from all faiths traveled to revel at the site; in 630 A.D., the Prophet Mohammed led a group of Muslims there in the first official Hajj, destroying the idols placed there by polytheistic worshipers and re-dedicating the site in the name of Allah. The path that Mohammed and his followers traveled is retraced as part of the Hajj rituals which include making Hager's walk between Safa and Marwa, stoning the wall of Satan that tempted Ibrahim to defy God, slaughtering an animal in honor of the sacrifice that Ibrahim made to save his son and climbing the Mount of Arafat from which Mohammed made his last sermon. The ultimate rite of passage during the Hajj is circling the Kaaba, an immense black cube, spiritually considered by Muslims to be the center of the world, and literally located in the center of the Masjid al-Haram mosque in Mecca. During the Hajj, vast swells of worshippers seeking forgiveness circle the Kaaba counter-clockwise, seven times. Completion of all of the mandated rituals is believed the guarantee the pilgrim a place in heaven as well as the title of hajji (literally, one who has performed the Hajj)  coveted and admired in Muslim communities around the world. Though only a fraction of Muslims are capable of making the pilgrimage, the huge crowds of worshipers that descend upon Mecca every year continually test the site's ability to accommodate their number. The Saudi Arabian government has spent billions to expand and improve the structure of the site, erecting tents to accommodate pilgrims and building multi-level pathways to eliminate congestion. Overcrowding and occasional stampedes have led to the deaths by trampling of thousands of worshippers over the years; most notably the 1990 incident where 1,426 people were crushed inside a tunnel connecting the Holy sites. While there is no way to know how hard the swine flu epidemic will hit worshipers this year, the tenacity of pilgrims has shown that there is little that can keep them away from this experience.